This projector looks really great, even right out of the box meaning if you never change its settings, it is still going to impress you. Of course, like any projector, the Epson Home Cinema 2000 can be enhanced with adjustments, but unlike many competitors, it never looks bad. Everyone (especially sports fans) looking for a bright, slightly above entry-level performance projector will be at least a bit impressed with this model. Not only is this projector extremely bright, but it also boasts a couple of tricks up its sleeve. It is both 3D and 2D capable (however, glasses are not included in the price, so you need to buy them separately). With 1800 lumens of white brightness, and 1800 lumens of color brightness, images are always brilliant and rich. This projector will ensure enjoyable viewing of any blockbuster film, sport event, and more, with images up to 300 inches on virtually any screen or wall. You can use your own speakers or the built-in sound on the projector which is really easy to set up. It boasts two HDMI connectors, and MHL connectivity turns it into a smart display, ensuring instant access to videos, games, and movies from MHL-enabled tablets and smartphones. 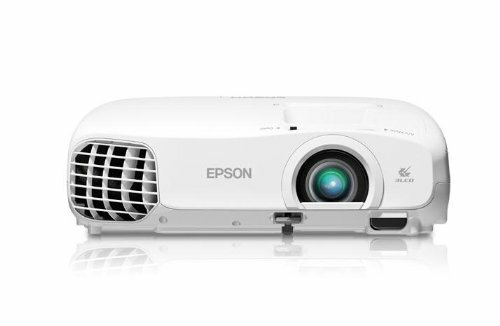 The Epson Home Cinema 2000 is compact and light enough so you will be able to move it around your house with ease. It is extremely easy to mount as well as to set up, and the settings are really easy to adjust as well. It will work fine whether you mount it on your ceiling or use it on a tabletop. Moreover, this home projector is very bright. As we already mentioned, it offers 1800 lumens, and the pictures and video are good enough even if the lights are on. Anyway, you will probably dim the lights to get that true cinematic effect, but this projector will display video nicely even if you try watching movies in your backyard. The projector is really awesome for 3D viewing, as well. Finally, the price of this great model from Epson will not disappoint you too, since it offers many great features, and provides excellent viewing experience for not too much money. This 3LCD projector weights only 6.4 pounds and its dimensions are 9.7 x 11.7 x 4.1 inches, so it is pretty compact and portable. The projector utilizes USB 2.0 and boasts PC free connectivity, as well so there is no need for another device when doing your photo sessions. The Epson Home Cinema 2000 comes with several different color modes that are built into the system, and are optimized for different content types.